On both sliding doors and atrium style doors, one side of the Plissé is mounted on the surface of the fixed door panel using our unique surface mount adapter. 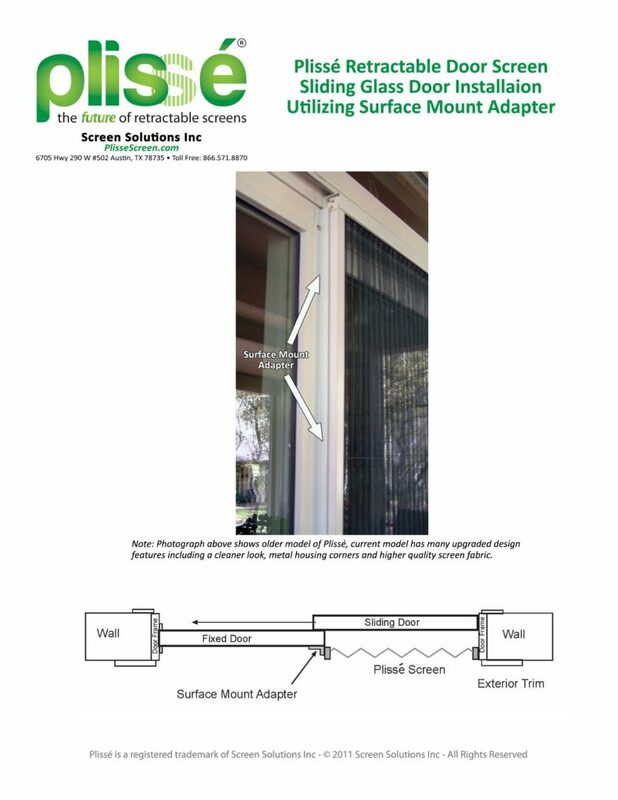 *With the new Plissé II now available you no longer need the following Surface Mount Adapter installation instructions because if you order the adapter it will come already installed to the Plissé retractable door screen for you. We are continuing to provide the following instructions for reference purposes only to help demonstrate how the adapter works and is installed. IMPORTANT: The following is an overview of the Screen Solutions Inc Surface Mount Adapter Installation Instructions. This is not a substitute for the installation instructions that will be shipped with your surface mount adapter. The actual instructions you will receive with your purchase will include to scale drawings of the referenced screws that will also come with your adapter. If you have any questions about the Plissé retractable screen or the surface mount adapter please email info@plissescreen.com. The adapter is shipped cut to the nominal height of your screen. Depending on your application it may be necessary to cut the adapter’s length using your hacksaw. Be sure to protect the adapter with a piece of cloth while cutting. 1. Position the adapter (S-A) on a flat surface next to the opening to be screened. 2. Use the #6 x 1” SS PhillipsTruss Head Screws (SB) provided to attach the adapter to this surface. 3. After Step 5-A mark position of screen mounting holes on the adapter by putting the screen assembly in place and using the holes in the frame as a guide. 4. Move the screen assembly out of the way and drill three 7/64” holes in the adapter being careful to drill through only one wall of the adapter. 5. Install the screen per included screen installation instructions. 6. If adapter is to be used on the side that the screen folds toward use the 3 #4 x 5/8” SS Phillips Truss Head Screws (S-C)provided with the adapter.